From about the mid 1700s a maltster’s and corn merchant’s business occupied the houses, cottages and workshops on this site, with a main dwelling house identifiable back to about 1780. The de Paravicini family owned the whole property from the 1860s to 1920 and are likely to have rebuilt the main house and perhaps Riverside Corner as well. They were part of the network of rich and highly influential families in the village at that time and included another successful sportsman, Percy John de Paravicini. The great cricketer Capt. 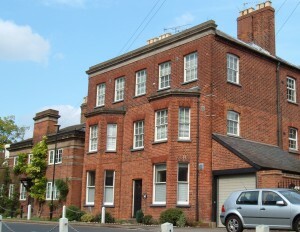 Frederick Pelham Warner, MBE, known as Plum, lived here in the late 1920s after he had retired from playing.The actress Billie Whitelaw bought Riverside Corner in the 1960s, describing it as her ‘little house by the river’ and drawn to Datchet by her friend Donald Pleasance who then lived at the Willows on the opposite corner of Queens Road. Kelly’s Directory, a forerunner of the modern telephone directory, gives three flats in Riverside House from 1931, the first year in which Riverside Corner is also listed. In 1970 it was called Dolphin Cottage. Kelly’s was not published every year and this is only a representative ‘snapshot’ of occupants. 2) James second son, Percy John Marcus de Paravicini, married Lady Eva’s sister, Lady Marcia Charlotte Sophia Cholmondeley, in 1891 and they had three sons (Percy Gerald, John Marcus and Charles Prior Evelyn). Percy John himself had a notable career in both cricket and football from his days at Eton and as an Old Etonian, and also playing cricket for Middlesex and Cambridge University. His Old Etonian football team was part of the last ‘all amateur’ FA cup final in 1882 and the following year was selected for all three England international matches. Outside sport he was a J.P. for Buckinghamshire, commanded the Datchet Volunteer Platoon during the First World War, and was a long-standing Chairman of the Trustees of the village’s Working Men’s Club. He was decorated with the order Commander, Royal Victorian Order, which recognises distinguished personal service to the order’s Sovereign, the reigning monarch of the Commonwealth realms or any members of her family. Percy’s obituary in Wisden states that, Few men personally more popular have ever been seen in the cricket field. Percy John died at Pangbourne in 1921 and has a memorial in the church at Datchet which describes him as living in the village 1864-1920 and as the Vicar’s Churchwarden for many years. One of his three sons, Major Marcus John who died in France in 1917, is also commemorated there. It could well have been Percy John’s cricketing career that brought ‘Plum’ to live in Riverside House by 1924, closely following Percy John’s death. 3) James’s third son, Prior Frederick de Paravicini, seems not to have married but was living in Montagu Road in the late 1890s. In 1901 only the families of a gardener and coachman were present as caretakers. 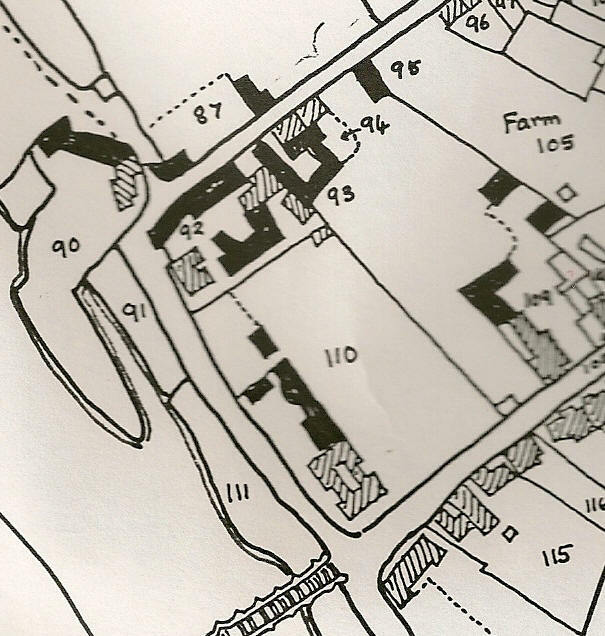 These three censuses distinguish two (rather than three) separate dwellings in the same ownership but different occupation. 1861, main house: The Mason family were clearly from Windsor and nothing more is known about them or their presence in Datchet. 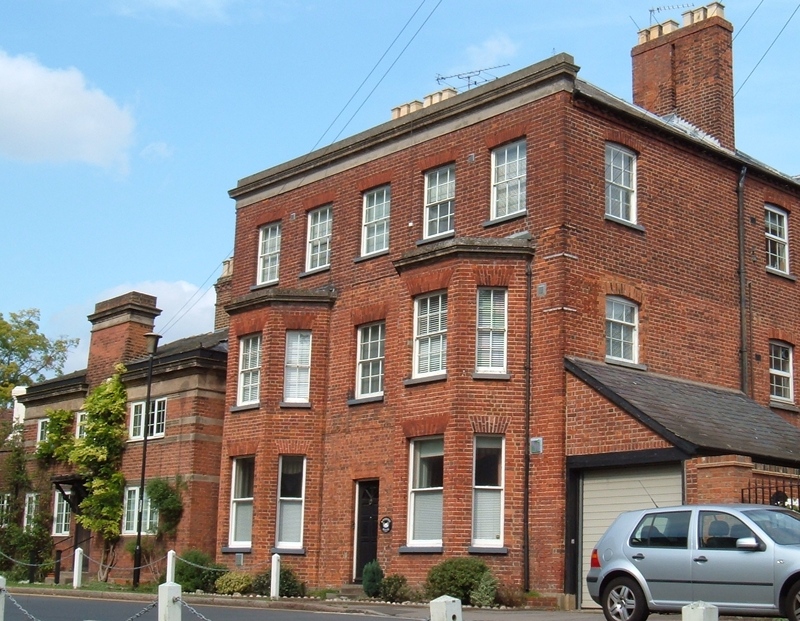 1861, lesser house: The premises formerly occupied by Cooper’s merchant’s business were empty in 1861 and when J.P de Paravicini bought the whole corner property a couple of years later it became entirely residential. 1851, main house: The West family were of some wealth and status, demonstrated by their memorials in the parish church. After the death of his wife Martha in 1860, James contributed a beautiful window to the new church building, as so many rich families were doing at that time.It is in the south aisle, just past the south door where the font then stood, and depicts the Baptism of Jesus and the Last Supper. 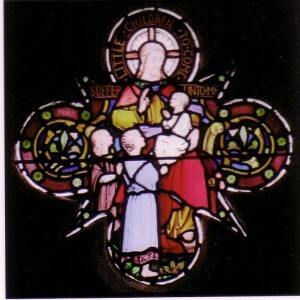 Above it is this quatrefoil showing Jesus allowing the children to come to Him. Window by Lavers & Barraud, 1865. The family’s ledger stone grave is on the N side of the churchyard: Martha 1797-1860; son James died 1844, age 21; father James died Windsor 1876 age 84. 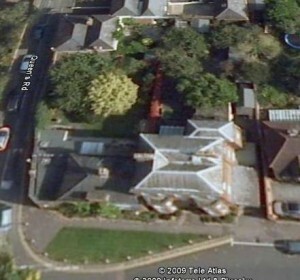 1851, lesser house: The Cooper family’s corn and coal merchant’s business had begun as a maltster’s in the early 1800s; it is not known whether they were actually brewing here, but were a branch of Cooper’s in Datchet lane, Windsor, formerly Isherwood’s where brewing had long been carried out. George’s (d.1853) and his wife Eliza’s (d 1852) tombstone is also in the north of the churchyard. 1841, main house: Late Deschamps, so in this year it is the main house which was empty; Deschamps’ also appears is in the Windsor Directory for 1844: as Wm Deschamps esq, Datchet. The tombstone of Fanny Paxton Walsh, who lived at number 6 High Street (next door to the Corden family), describes her as the daughter of William Wentworth Deschamps, which must account for him living here. 1841, lesser house: George Cooper, maltster. the Cooper family also appears in the 1830 Windsor Directory: George and William Cooper, merchants, Datchet Lane Windsor & Datchet, when the William must have been George’s father as his son William would be too young. Land Tax Records, 1832 back to 1780s To go back before the censuses and Rate map, the difficult Land Tax records have to be used. They give no locations and it is only with familiarity that any sense can be gleaned from the listings. Only years when there was a change are recorded; all others will be the same occupant as previously. The Cooper family clearly made a distinction between the main and the lesser houses, owning and occupying them in a complicated way, but there is no way now of telling which was which. 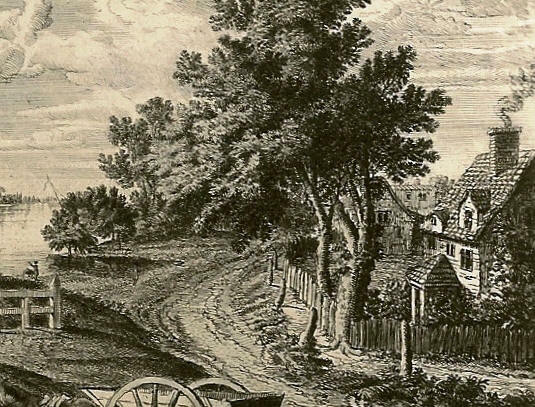 It was probably the death of William Sturges, in 1811 that left the premises available to buy, presumably as an extension to the Datchet Lane business in Windsor. Since he was also a maltster these premises could have been used as such for a very long time past.The term tenements implies multi-occupied houses or cottages, let or sub-let to tenants so it seems that the Coopers undertook refurbishments at least by about 1830. The Sturges family owned shares in the iron trade in Bradford, where a John Sturges was an ironfounder. William’s 1812 will describes him as a gentleman, although his father William the elder is styled in his will of 1802 as a maltster.The family’s status seems to have been rising, and they were connected, through William the younger’s wife Jane, to the Windsor publisher Charles Knight and to the Earlys and Simons, other wealthy Datchet families. There were five Sturges daughters, only one of whom married, and by the late 1830s they were tenants at Old Bridge House with an income each from the ironfoundry shares. The daughters Jane and Sophia dedicated a window in the church to their parents, but retrospectively because William died in 1811 and Jane in 1835. Like the West’s window it is in the south aisle, close to the choir stalls. Two panels show the Annunciation and the finding of Christ in the Temple by Mary and Joseph. It was also made in 1865 by Lavers and Barraud . An early image of Riverside House? This is a magnified detail of a tiny part of the only known image of the first bridge over the Thames at Datchet; it was published in 1780 but the bridge itself had been rebuilt in 1770 so the actual date of this view is open to doubt, except it must be after 1706 when the bridge was built.This view has the start of the bridge’s structure on left and the wheel of a wagon crossing it at the lower edge. 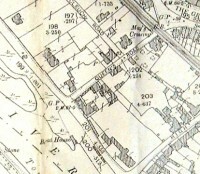 The river shore is where the river garden is now and the house in the right foreground is on the site of Datchet Lodge on the High Street corner. Beyond this house another can be seen, towards the Queens Road corner, and in the far distance is a big house rather similar to Riverside House itself. It is unlike the other two houses, which are just cottages, looking as if it is built in the 18th century classical style. 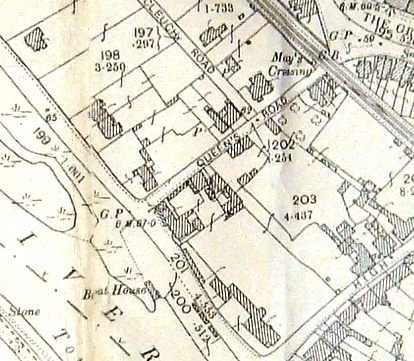 However, it is possible that the mid-distance cottage was in fact the forerunner of Riverside and the one seen behind it was the Willows on the opposite side of Queens Road. The jury is currently out on this one!